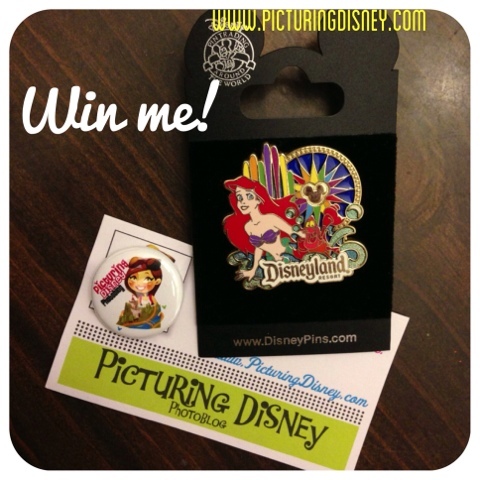 Picturing Disney: WIN A DISNEYLAND AUTHENTIC ARIEL PIN! This has been a banner week for me here on Picturing Disney! The life of a blogger isn't always very validating but in the last week I have been invited to a Disney Consumer Products Press Event AND have been invited access to the Disney Parks media news site! I feel so official!!! To boot my parents got me an amazing early birthday gift-- I am now a Disney stockholder!! To celebrate all the good Disney-ness in my life I want to spread some Disney joy! Enter below for a chance to win this lovely Ariel Disneyland pin features everyone's favorite swimming princess, Sebastian and World of Color! To Enter: Comment below and tell me your favorite Disney animated film (hand-drawn feature film) and why its your fave! I tried to pick one myself but all of the "new classics" tie for me-- Lion King, Aladdin, Little Mermaid, Beauty and the Beast... I just can't pick! On Friday I will randomly choose a comment and post the winner in comments here and on our Facebook page! Sorry international readers but this contest is open to United States residents only. It's a tie between Peter Pan and The Little Mermaid. Although when I was little Pocahontas was my all time favorite, I wore my Pocahontas outfit all the time! Definitely Hunchback of Notre Dame! I had everything with Esmeralda on it. The movie is just so fun and everything is super colorful! Beauty and the Beast is my favorite! Very good animation and the songs are amazing! I love that it's has a woman rescuing a man for once! Belle is so Awesome! I always wanted to be here when I was a kid :) Thanks for the chance I love the pin! I just love Sleeping Beauty. It's beautifully drawn (love! the restoration), I love the story, and Aurora ties with Cinderella as my fave Disney Princess. Hands down - Peter Pan. Second, Beauty and the Beast. Aladdin. It was my 1st date ever. Even if the date did stink, it was a great movie. Snow White. I love Dopey. I'm torn between Peter Pan and Sleeping Beauty.. and I just saw sleeping beauty for the first time (that I recall) in the last year.. I LOVED it! I love Beauty and the Beast. My son played Lumiere in his High School's production. Peter pan for me. It reminds me of when I was younger and always went on "adventures" and was up to no good! Bambi. Who do you love more--Bambi or Thumper? I can never decide. Makes me cry every time I see it. As newlyweds. I made my husband take me to the drive-in to see it!! Toss up between Cinderella and Little Mermaid! Cinderella is my all time favorite movie. I remember my mom taking me to see it as a little girl. The Little Mermaid, I love the songs, used to sing to ''Part of your world'' all the time. Beauty and the Beast is my all time favorite. Belle is a reader and proves you don't have to be an airhead to be a princess. Celine Dion (my favorite singer) sings on the sound track. My favorite has to be the Fox and the Hound. I saw this movie as a child and loved it immediately because of the animals but as I grew older I began to love it even more because it showed the power of friendship. I cry every time I watch it. I would say Peter Pan and that's because right now my son LOVES Peter Pan! Sleeping Beauty...I have lways loved Aurora and one day I hope to see her castle and not just Cinderella's! Def Little Mermaid, cause I love watching my daughter smile and sing along with it! It's her absolute favorite! Love Beauty and the Beast!! It's a hard one...I would say all three of the ones you said too! My favorite out of the three is probably Beauty & the Beast because I love a brunette princess! I love the songs from all of them! It's so hard to pick, but I think I'll go with Beauty and the Beast! Snow white! Because my grandmother always talked about seeing it at the movies as a child. And the commercials that say "the one that started it all". Mine is Beauty and the Beast, always, will never change my mind! the rescuers. Its hard to explain- I love the look and feel of it. My favorite is Beauty and the Beast. I could watch it over and over again. I love that Belle is so smart and takes charge of her own life. My Fav still has to be "Bambi." Whem I was five that was the very first movie I was old enough to go to with mom and dad. I still remember the movie theater, it was in Oakland, Ca at the "Grand Lake Theater" near Lake Merritt. I remember I had a dress on with white shoes (don't remember know the color of the dress) we sat in the Balcony. I sat there trying to be good, cause I wanted my parents to bring back to the movies. To this day I still love the movies, but "Bambi" will always bring back that special memory. Lilo and Stitch. My bridal party joined my husband and I to see it the night before the wedding and my stuffed Stitch was my focal point in the hospital when I was having our daughter. The Little Mermaid is my absolute favorite! It came out at a time in my life when I needed something to dream on. Jodi Benson is my favorite actress, and I truly love how dedicated she is to Ariel. The Great Mouse Detective has always been my favorite. It exposes kids to literature besides the fairytales. And, I've always loved a mystery. I would have to say....... Brave. I know it is a new one but I just loved it so much. My favorite Disney cartoon will always be Cinderella. Cinderella captured my imagination as a child and is still magical to me. Beauty & the Beast! The story is great & I love the songs! Plus my son & I used to watch it over & over & over again when he was little so it has great memories. I would say Alice in Wonderland...I love Alice and the madhatter. My husband says Beauty and the Beast. But then again we both LOVE fire redheads. I wish I could be a redhead. My favorite is Toy Story 2. I love the story and I like that it brings in Jesse! I love Beauty & The Beast because of how the beast turn out to be at the end. Beauty and the Beast is the favorite in my house!!!! Also hard for me to pick a favorite now, but Cinderella was my favorite as a child. Beauty and the Beast, because Belle loves to read like me. I even named my dog Bella! Good questions! I love Bambi-- whenever my dog runs to fast in the kitchen and slips I call him Bambi on ice! lol! How did you just see Sleeping Beauty for the first time? It is one of my sisters favorites ever so I must have seen it 100s of times as a kid! Thank you for all your entries! Comments are now closed for this contest. The winner is Lisa Harris Clark! No clue! I might have seen it when I was little and have no recollection.. but it seemed like new when I watched it! I love Sleeping Beauty! I just love the whole storyline. Tangled is a new one, but it is my favorite!! It has such funny parts in it and keeps the family laughing. Thats how I feel about Bambi! Lisa- Its been 48 hours and I have posted you as winner here and on Facebook! Please email me your shipping info by midnight tonight (2/10/13) or I will have to choose a new winner! !